Anglesey RSVP set with OFFSET printed RSVP and OFFSETprinted RSVP envelopes. 110 pound RSVP card in 100% cotton Ecru cardstock. Thick! Comes with Champagne A2 RSVP envelope in same paper as the mailing envelope. Smashing and stately. WE DID NOT INCLUDE ANY PRINTING COSTS IN THE BASE PRICE. PLEASE CLICK ON 'WE PRINT' BUTTON AND THEN CHECK OFF THE BOXES FOR THE PARTS OF THE RSVP YOU WANT US TO PRINT. Please call if you need clarification. We want to make a gorgeous invitation set with a stunning mix of custom letterpress printing and stately offset printing that is moderately priced. 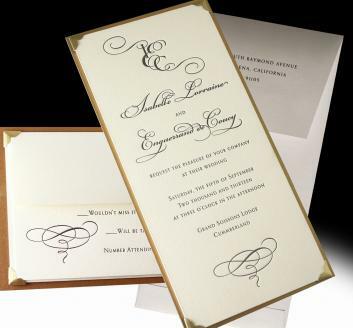 ~MAJESTIC MONOGRAM LETTERPRESS Wedding Invitations~ PRICE INCLUDES 1 COLOR LETTERPRESS PRINTING ON INVITE CARD. Envelopes printed offset, rsvp set and enclosure cards printed offset. NOT AVAILABLE AS DIY (too thick to DIY print). Classic and Stately. This design is inspired by the invitations and menus we created for the Duke and Duchess of Cambridge BAFTA Brits to Watch event in Los Angeles this year. WE BUILT LETTERPRESS + CUSTOM MONOGRAM DESIGN INTO THE PRICE. PLEASE CLICK ON "WE PRINT QUOTE" button below. CHECK ITEM BOXES FOR EXACT QUANTITY QUOTE!! Tall: measures 9.75 inches x 4.75 inches. WE WILL DESIGN A CUSTOM MONOGRAM FOR YOU! DIY duties: Mount invite card to the backing card with self-adhesive photocorners. Thick, luxurious ecru 100% cotton 220 lb. Lettra paper by Crane mounted on Antique Gold Italian pearlescent paper. Includes gold photocorners for mounting. RSVP set mounts on the back of the Invite card - using gold photocorners. Gorgeous mix of matte paper and pearlescent papers and envelopes. Click on WE PRINT QUOTE button for exact quote. Mailing Envelope:Tall Elegant Custom Envelope with Long Flap at Top. Made from 70 pound Italian Champagne Pearlescent Paper. Measures 10 inches x 5 inches.